own now. My thought was if they were free just how good can they? But one day while searching for a “free flyer” I thought “why not check them out to see what they were like”. And what a wonderful surprise they were? I discovered several quality, easy to edit templates right under my nose just waiting to be used. And some of them were perfect for what I needed at the time. For example, I found a free “For Rent” flyer with tear off strips at the bottom of it that allows up to 8 people to tear off a phone number for later use. That's right, up to 8 people per flyer could tear off a number and call it. How’s that for impact marketing? Click here to see it. Here's another good one! If you’re a FSBO looking for a free flyer then check this one out. Click here to see it. 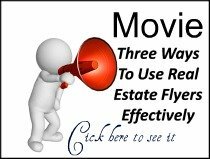 These free real estate marketing flyer templates allow you to easily change pictures, modify fonts and styles, move images within the templates and even resize them. Not only are they free to use, you’ll have almost no cost in printing them if you have a printer (and who doesn’t?). So, how many leads do you think you can get if you print 50 plus flyers and post them in targeted, hot locations; like Laundromats, college campuses, grocery stores, gas stations, convenience stores, restaurants, on cars in shopping malls, etc.? 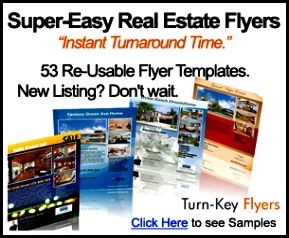 "You might be as surprised about how good Free Real Estate Flyer Software can be. I was!."